(Nanowerk Spotlight) You might have seen the news article that made the rounds a few days ago about how the stained glass windows in medieval churches actually were a nanotechnology application capable of purifying air (Stained glass church windows - nanotechnology air purifiers?). While this is a pretty cool headline to capture readers' interest, the underlying finding is much more profound and could open up a new direction in catalysis and herald significant changes in the economy and environmental impact of chemical production. One of the great challenges for catalysis is to find catalysts which can work well under visible light. If scientists manage to crack this problem it would mean that we could use sunlight – the ultimate free, abundant and 'green' energy source – to drive chemical reactions. This is in contrast to today's conventional chemical reactions that often require high temperatures and therefore waste a lot of energy. Almost half of the solar energy that hits the surface of the Earth comes in the form of visible light. Developing photocatalysts that respond to visible light would allow us to utilize much of the solar spectrum for instance for the production of hydrogen energy by splitting water, purification of water and air (see the church windows), and other catalytic applications. Back in the early 1800's it was observed that certain chemicals can speed up a chemical reaction – a process that became known as catalysis and that has become the foundation of the modern chemical industry. By some estimates 90% of all commercially produced chemical products involve catalysts at some stage in the process of their manufacture. Catalysis is the acceleration of a chemical reaction by means of a substance, called a catalyst, which is itself not consumed by the overall reaction. The most effective catalysts are usually transition metals or transition metal complexes. "Many approaches have been proposed to develop visible light photocatalysts, including doping titanium dioxide with metal ions or metal atom clusters, incorporating nitrogen and carbon into titanium dioxide, and employing other metal oxides or polymetallates as catalyst materials" Dr. Huai Yong Zhu explains to Nanowerk. "Research has been mainly concentrated on semiconductor oxides. Sulfides have also been studied, but they are not suitable catalysts because of their poor chemical stability. 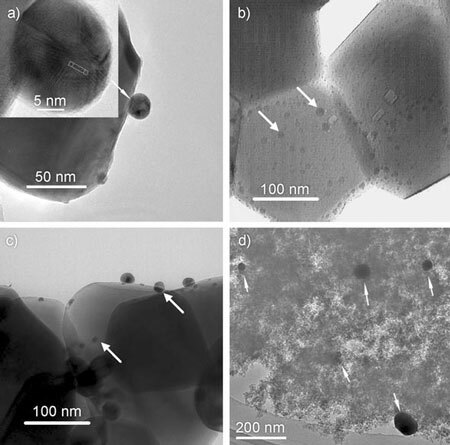 However, searching for catalysts that can work under visible light should not be limited to semiconductor materials with band-gap structure, but can be extended to other materials, such as gold nanoparticles." What Zhu, an Associate Professor in the School of Physical & Chemical Sciences at the Queensland University of Technology in Australia, and his collaborators have found and described so poignantly with the example of church windows as photocatalytic air purifier with nanostructured gold catalysts, is that visible light can drive oxidation of formaldehyde and methanol on gold nanoparticles dispersed on oxide supports in air without external heating. Zhu, together with colleagues from Queensland University of Technology and Dr. Xue Ping Gao from the Institute of New Energy Material Chemistry at Nankai University in Tianjin, PR China, have published their findings in a recent edition of Angewandte Chemie International (Visible-Light-Driven Oxidation of Organic Contaminants in Air with Gold Nanoparticle Catalysts on Oxide Supports). Gold nanoparticles absorb visible light intensely because of the surface plasmon resonance (SPR) effect. Zhu and his collaborators reckoned that the combination of the SPR absorption and the catalytic activity of gold nanoparticles could present an important opportunity: "If the heated gold nanoparticles could activate the organic molecules on them to induce oxidation of the organic compounds, then oxidation on gold catalysts can be driven by visible light at ambient temperature" says Zhu. Since the SPR is a local effect, limited to the noble metal particles, the particles – which generally account for only 2-4 wt% of the overall catalyst mass – are heated up quickly to a temperature at which the organic molecules are activated to react with oxygen. Compared to the conventional catalytic oxidation in which both the gold particles and the support material are heated to high temperatures, this leads to significant saving in energy consumption for catalyzing organic compound oxidation. The scientists found that a number of factors, such as particle size and morphology, and the dielectric constant of the oxide medium, can affect the SPR absorption of gold nanoparticles and thus the activity of the gold catalyst. "Our findings open up a new direction in photocatalysis as the proposed reaction mechanism is distinctly different from that catalyzed by semiconductor photocatalysts" says Zhu. "Based on our results, we propose a tentative reaction mechanism for the light-driven catalytic oxidation. The irradiation of incident light with a wavelength in the range of the SPR band may result in two consequences. The first is that light absorption by the gold nanoparticles could heat these nanoparticles up quickly. The second consequence is that the interaction between the oscillating local electromagnetic fields and polar molecules also assists in activating the molecules. The activated polar organic molecules react with oxygen in close proximity." Zhu points out that this light-driven reaction can proceed at ambient temperature at reaction rate similar to those of the catalytic oxidation under heating and could, for example, find convenient applications in indoor air purification. The finding also reveal the possibility to drive other reactions with abundant sunlight on gold nanoparticles at ambient temperature.